ON the hottest day of the year Stormont parties went toe-to-toe over what is arguably the most incendiary issue they face: money. They may well fight about the Troubles and row over the role of individuals in the violence of the past, but nothing risks undermining a party’s prospects in these austere times more than allegations of an unsavoury relationship with big business. That is why the Assembly was recalled from summer recess to debate allegations raised by the BBC Spotlight programme linking the DUP to discredited building contractor Red Sky, which was able to lobby the party’s minister despite being stripped of public housing repair contracts as a result of shoddy work and over-charging. The DUP went on the attack even before the debate began by using Assembly procedures to scupper a motion demanding a full inquiry into the affair, with DUP heavy hitter Sammy Wilson declaring the party wanted others investigated too: “Members have asked why we tabled a petition of concern. But two factors have emerged from the smoke following a rowdy Stormont debate: firstly, that the additional allegations of a DUP relationship with a double-glazing firm are now coming under closer scrutiny, and secondly, that the DUP has for some reason set out to attack its former member and arch-critic Jim Allister. Both factors appear to signal that the DUP now believes it is not just housing minister Nelson McCausland’s reputation that is on the line, but potentially that of the party itself. And the DUP is fighting tooth and nail. The allegation is that the party went into bat for the Red Sky company which was being stripped of lucrative public sector contracts – claims which were examined previously on The Detail here. It is further alleged by DUP councillor Jenny Palmer and a member of the Housing Executive board at the time, that she received a phone call from Mr McCausland’s Special Adviser asking her to use her role to act in DUP interests – something strenuously denied by the party. The DUP insists it was focused on saving jobs at Red Sky and was mindful of the fact that other firms on the Housing Executive payroll had questions to answer. But much wider issues came into play on the floor of the Assembly. When the DUP’s Robin Newton waved a picture he claimed placed the SDLP side-by-side with another contractor embroiled in the row over Housing Executive payments, Jim Allister said: “Mr Newton thinks that there is some great importance in photographs. “Well he did not quite produce the DUP family album, but I wonder whether there would be any photographs of dinner parties in the home of Mr Norman Hayes (former Managing Director of Red Sky). 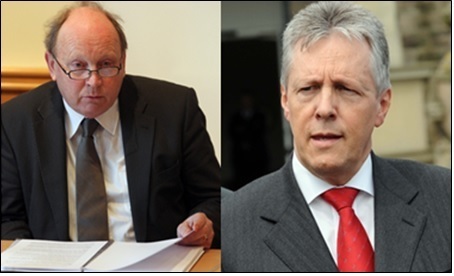 DUP leader and First Minister Peter Robinson led the fight-back, asking if Mr Allister would like to declare any interest in those featured in the Spotlight documentary. The Traditional Unionist Voice (TUV) party leader, who famously split with the DUP over its decision to enter government with Sinn Féin, confirmed that when he was a lawyer he “gave advices” to double glazing contractor Trevor Turkington but said it was “absolutely nothing to do with this case”. Later Sammy Wilson launched a further attack: “I remind Mr Allister that given some of the interventions from the First Minister, he might just want to be very careful. “I think that an Exocet has been launched today that will eventually find its target. The cant, hypocrisy and pseudo outrage that he is so good at will be blown away once that Exocet reaches its target." The DUP benches were packed and its representatives were in fiery mood from the first exchanges. Sinn Féin’s Caitriona Ruane spelt out the seriousness of the allegations: that the DUP housing minister Nelson McCausland and party colleagues met Red Sky bosses while the company was in administration – a time when it is claimed the former owners may have hoped to effectively claw their contracts back. “There is no place for a brown envelope culture anywhere on this island, and the DUP and Nelson McCausland have major questions to answer,” she said. She spoke over catcalls about the role of the IRA in the Troubles and the infamous Northern Bank robbery. But was `plurality’ a defence or a smokescreen? Did wrongdoing by others make it okay to meet Red Sky? The DUP’s Robin Newton told critics it was not about helping any company, he argued that the explanation for the meeting was simple, it was about saving jobs. “The situation in east Belfast was this: 450 jobs were at stake — local jobs and jobs for people from outside east Belfast. From both sides of the community, 450 families would suffer,” he said. Sinn Féin’s Daithí McKay focused on the minister’s dealings with doubleglazing contractor Turkingtons. The Sinn Féin representative cited a draft letter to the chair of the Committee for Social Development where an early reference to meeting Turkingtons was apparently replaced to say the minister had met those representing Glass and Glazing Federation and Fusion21. While opponents draw links between the firm and the DUP, the party says there is no case to answer over the window discussions and it accuses critics of stirring unwarranted controversy. When he addressed the Assembly Mr McCausland dismissed all allegations of wrongdoing against him and his party and said his primary concern had always been to serve the interests of the public. “At all times, I have sought in every way to carry out my duties with the utmost integrity and probity. “I also assure you that I have never sought to influence the award of any contract to any company." His colleague Sammy Wilson went on to again dismiss the whole affair: “It has been said that there are two issues that we have not addressed. “The first is that of the meeting of Red Sky and Turkingtons. Following the inevitable collapse of the Assembly motion, focus now shifts onto a promised inquiry by the Assembly’s Committee for Social Development, though there will be calls for wider probes. The DUP says this is a witch hunt and that it is entirely innocent. It has asked questions of other Stormont parties and is seeking to pull them into the debacle. No side has landed a killer blow in this political fight, but the DUP is clearly signalling to its opponents that when it comes to defending its name, it will pull no punches. It was a hot day and there could be more to come.